Here are some of the best sight word games that are actually fun to play and make learning to read easier. Playing games is an awesome way to learn and I have used this method often in my household. Sight words are commonly used words that it is best to know on sight, as opposed to trying to sound them out. Once kids learn these words it is amazing at how fast they move in their quest to learn to read. Grab a few of these games and just play, play, play. You will be surprised at just how quickly your child picks up the words when they are playing the games. Play is a wonderful way to learn and using the best sight word games is just the ticket. They use sight words in an entertaining and fun way and kids learn easier and quicker. Wonderful! Have you heard of the Zingo Sight Word Game? It is a popular option! This game is bingo-like game with a neat dispenser. Quite a few homeschoolers I know have this game and it is used in schools as well. Best of all kids love it. Pop up a batch of popcorn and grab this game for an enjoyable family game night. Pop for Sight Words is a highly rated game in which you take popcorn from the popcorn box. Each piece has a word on it. If you can read the word you get to keep it. If you pick a “pop” card all your pieces go back. You can certainly adapt the game by removing the “pop” cards if your child wouldn’t enjoy losing all his cards. Sight Word Splat is a fast-paced game with boy-appeal. The game is based on matching words. So, you draw a card from the deck and see if you have that card. If so, you call Splat! It can be played as a memory game as well. Using Magnetic Sight Words you can create your own sight word game. My son and I love to play with words and have always enjoyed this type of game. You get over 240 sight word magnets and punctuation marks. There are repeats of popular words. Use the magnets to make up sentences – including silly ones! Brought to you by the makers of the popcorn game, Stacker Crackers is a stacking sight word game . This game is all about stacking up the cheese and cracker cards. Highest stack wins! This game is a simple bingo game but the words are perfect for older kids or more advanced readers.It includes 60 words and goes up to 4th grade level. If you love Spot It! you will like this one Spot It! Basic English was designed at the request of teachers. This game is like the classic Spot It! with a sight word twist. Matches can be picture/word, picture/picture or word/word. We like Spot It! and this this is a great choice. Do your kids like pizza? Then try this game! It includes both Dolch and Fry sight words. The object of the game is to build your own pizza by reading sight words on the ingredients and putting them on your pizza. Swat a Sight Word Very interactiveis an instant “hit.” While I have seen variations of this game, I like how cute this one is. The bugs are colorful and have big eyes and little wings. They also have sight words written on them. All of the bugs are laid out on the table and a word called. When your child finds the word he swats it with the included swatter and gets to take the piece. ! Waiting until your child is curious about reading is the best way to go. If he wants to learn to read, these games are a fun way to get started. 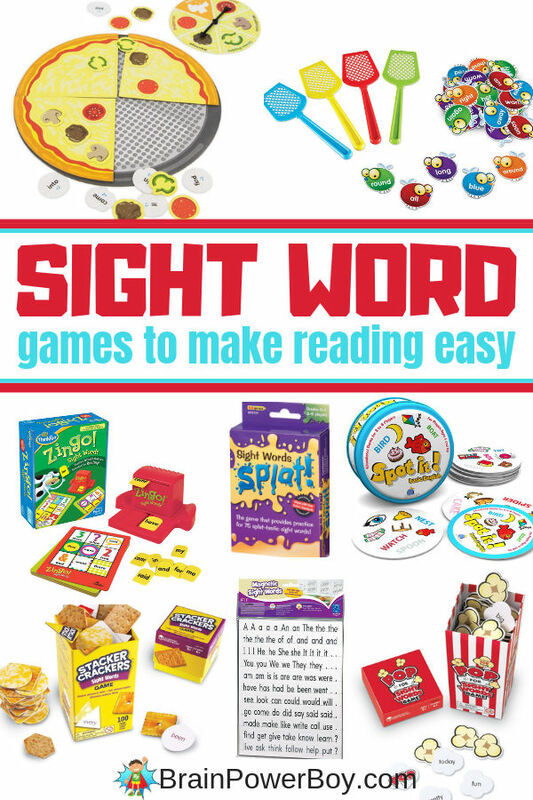 If you enjoyed this list of the best sight word games but sure to check out our other sight word articles. We have a lot of wonderful ideas for you. If you are looking for other gift ideas for boys (both educational and fun!) see our gift guide for boys page.